Join Stacy and Amy for a rejuvenating long weekend at the beautiful Four Seasons Resort Rancho Encantado in Santa Fe, New Mexico. You’ll enjoy daily yoga classes, meditation, delicious food, and wonderful company. 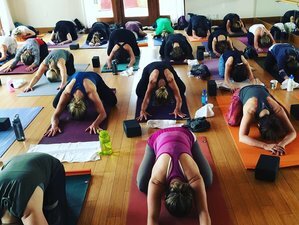 The morning and afternoon class offerings will be suitable for all levels and will range from challenging Vinyasa to Gentle yoga as well as workshops to refine your practice. Nourish your spirit with this unforgettable experience of restoration and relaxation. Four Seasons Resort Rancho Encantado Santa Fe offers a one-of-kind luxury getaway in the heart of New Mexico, one of the most romantic and adventurous getaways. The resort offers 65 casita guest rooms and suites combining Four Seasons' excellent services such as regionally-inspired spa treatments, a restaurant with local influences and ingredients, and exclusive access to adventure and nature. Each room at the resort has an indoor fireplace as well as a private terrace with stunning views. Stacy and Amy share a passion for yoga, music, and traveling. Their approach to yoga is non-competitive, fun, spiritual and nurturing. Both based in Chicago, they are the co-founders of Pure Living Yoga Retreats. Pure Living thoughtfully curates yoga retreats that combine beautiful destinations, luxury accommodations, delicious food, relaxing spa treatments, healing yoga programming, and like-minded community to create an unforgettable and impactful retreat experience. In this 3-night / 4-day retreat, you'll enjoy daily yoga classes, meditation, delicious food, and wonderful company. The morning and afternoon class offerings will be suitable for all levels and will range from challenging Vinyasa to Gentle yoga as well as workshops to deepen and refine your practice. There will be ample time to experience the great outdoors and explore this spiritual oasis by hiking and cycling in the mountains, pampering yourself at the award-winning spa or discovering the art, culture, and museums in downtown Santa Fe, only 10 minutes away. At night gather by the fire-pit for awe-inspiring sunsets and unbelievable stargazing. Nourish your spirit with this unforgettable experience of restoration and relaxation. Amy signed up for a meditation retreat in 1986 after learning that the Beatles had been touting its benefits a generation earlier. In 1994, she found herself on a meditation retreat in Nepal where she discovered and fell for yoga. She is an active volunteer with Yoga for Recovery, bringing yoga to female inmates and Prenatal yoga to expectant inmates at Cook County Jail. She completed both level I and II teacher training at Yogaview in Chicago where she currently teaches and practices. Stacey is a certified yoga instructor and holistic nutrition coach based in Chicago. She is a student of yoga and meditation since 2001 and teacher since 2011. She completed her 500-hour training at Yogaview and additional certifications in Restorative and therapeutic yoga. Her approach to teaching and coaching is one of openness and compassion, always honoring the needs of each individual. She is also certified in Thai massage and Reiki, also a two-time ambassador for Lululemon Athletica. She teaches group classes, private yoga sessions, and workshops in Chicago. This will take place at Four Seasons Resort Rancho Encantado in Santa Fe, New Mexico, USA. The resort is an easy 60 to 75 minutes' drive from Albuquerque International Sunport (ABQ). During your stay, you will be served a welcome dinner at Terra as well as morning coffee, tea, and fruit/pastry. Please book your flight to arrive at Albuquerque International Sunport (ABQ). You can either rent a car or the resort can help arrange a shuttle service. The resort is an easy 60 - 75-minute drive from ABQ. Pure Living Yoga Retreats offers a luxury retreat experience at beautiful destinations with all-level Vinyasa yoga, meditation, nature, and adventure.